1. Heat oil in a large frying pan over medium heat. Add onion, garlic, ginger, chilli and coriander roots. Cook for 7 minutes or until lightly browned. Add lamb, garam masala and turmeric and cook for a further 10 minutes or until mixture is browned and dry. Stir through coriander leaves and lemon juice. Season with salt and pepper and set aside to cool. 2. Place 280g flour and 1 teaspoon salt in a bowl. Pour in 220ml warm water and mix to a soft dough. Transfer dough to a lightly floured work surface and knead for 10 minutes or until smooth and elastic. Return to bowl, cover with a damp cloth and set aside for at least 1 hour. 3. Divide dough into 10 golf ball-size pieces. Transfer to a lightly floured work surface and roll out each piece to form a thin 20cm round. 4. Combine 2 tabespoon flour and 2 tablespoon warm water in a bowl. In a separate bowl, combine mince mixture and eggs. Shape 1 cup mixture into a square in the centre of each roti/flatebread. Fold in sides to enclose filling and seal with flour paste. 5. Heat 1 teaspoon ghee/melted butter in a frying pan over medium heat. Working one at a time, cook roti/flatebread for 2 minutes on each side or until golden. Repeat with remaining roti/flatebread and ghee/melted butter. 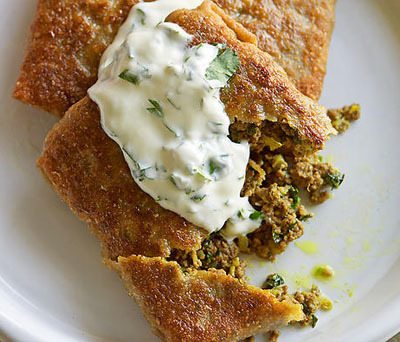 Serve with yoghurt mixed with chopped coriander.